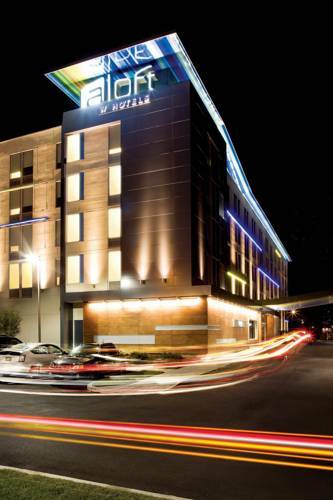 Celebrate your style at Aloft Atlanta Downtown, a hip new hotel where youll be steps away from the citys major attractions. We offer easy breezy access to major corporations, wedding venues, restaurants, museums, shopping, and golf courses. Meet & mingle with friends at our w xyz(SM) bar, grab a sweet, savory, or healthy snack from re:fuel by Aloft(SM), our 24/7 pantry, or play in our re:mix(SM) lounge. Plus, you can always stay connected with free hotel-wide wired and wireless High Speed Internet Access! Breeze into one of our Aloft rooms, featuring our ultra-comfortable signature bed, walk-in shower, custom amenities by Bliss Spa, and more. Our plug & play connectivity station charges all your electronics and links to the 42 LCD TV to maximize work and play. There's lots to explore nearby but come back soon so you don't miss out on all the buzz at Aloft! Clink! Meet, mix, and mingle over cocktails at our always happening W XYZ(SM) Bar. The fun flows freely with everything from pints to Pinot Noirs to specialty sippers, plus a snack-attack menu, mood music, and can t-miss events. Grab and go at Re:fuel by Aloft(SM), our self-serve gourmet pantry full of mix-and-match meals, make-your-own cappuccinos, and more. Available 24/7 for the ultimate convenience, it s the perfect place to refuel when you need a quick pick-me-up!